This is a satellite view of Mosta Fort. The Fort, designed primarily as an inland defence fort, was allegedly built on the site of a Bronze Age citadel and village (although no absolute proof exists of this). It has a commanding position along the line of a natural fault which cuts across the width of the island, now known as the Victoria Lines – and unofficially as, “The Great Wall of Malta”. 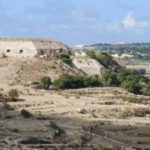 The fort is located approximately in the centre of this 12km fault and was intended to be part of a series of fortifications from east to west to concentrate the Malta’s fortified assets to the south. 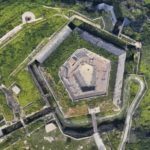 Built by the British sometime around 1880 it is a polygonal fort in the shape of a pentagon and is truly a marvel of British engineering. Though a formidable fort in its own right, it was never really used in anger and later became disused as the importance moved to coastal defence. 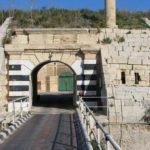 Our thanks go to the Armed Forces of Malta (AFM) for permitting AMACS to organise a visit by its members to this historical military installation which is normally off limits to the public. EOD static display and explanation of its roles and responsibilities. The AFM expressed their wish to collect money towards a donation to the Malta Community Chest Fund. Hence, we shall be collecting a €10.00 donation per visitor. In view of the restrictions expected when entering a military location, this visit shall be limited to a maximum of twenty-five paid-up members who are in possession of a 2018 Police Firearms licence. There are a few other small restrictions that are imposed on us during the visit but we will make those clear to members upon booking. Bookings will be accepted by the AMACS CEO on a first-come-first-served basis. To secure your place, please visit the club premises to pay your donation and sign the AFM indemnity form by Wednesday 16th May latest as we are required to submit names and ages of visitors to AFM ahead of the visit. To avoid disappointment, we recommend that you act fast as we expect the 25 places to be booked much earlier than that! On the day of the visit, members shall be requested to produce their Maltese ID cards and AMACS 2018 membership cards. Please make sure that you have these documents with you, otherwise you will be denied entry. Time: 09:00am – be punctual! Where: We are gathering by the roundabout just past the Mosta bridge.